Fried rice is a classic for many residents. 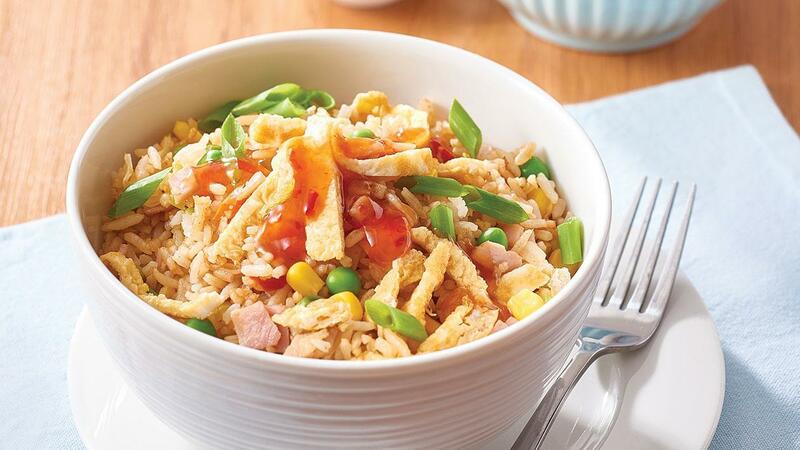 This simple fried rice recipe is full of flavour thanks to the combination of KNORR Japanese Teriyaki Sauce GF and KNORR Concentrated Liquid Stock. Heat oil in a large wok and add the combined eggs and water. Swirl around the wok until set into a thin firm omelette. Slice and set aside. Add extra oil. Cook celery until soft, then add frozen vegetables and rice, tossing to warm through. Stir through ham and chopped egg. Add the combinedKNORR Japanese Teriyaki Sauce GF and KNORR Concentrated Liquid Stock along with green onions. Cook until completely heated through. Serve with steamed vegetables or salad and a drizzle of KNORR Sakims Thai Sweet Chilli Sauce for extra flavour. Use mixed frozen vegetables such as a trio of corn, peas and capsicum.